The Seven Deadly Sins were once an active group of knights in the region of Britannia who disbanded after they supposedly plotted to overthrow the Liones Kingdom. Their supposed defeat came at the hands of the Holy Knights, but rumors continued to persist that they were still alive. Ten years later, the Holy Knights staged a coup d’état and captured the king, becoming the new, tyrannical rulers of the kingdom. The third princess, Elizabeth, then starts out on a journey to find the Seven Deadly Sins and enlist their help in taking back the kingdom. Over 27 volumes since 2012 and 10 million copies sold! 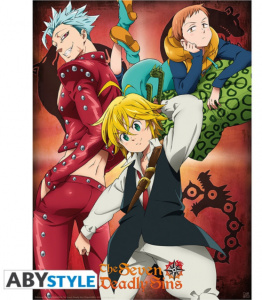 With true to character designs and high printing quality these posters bring to life the Seven Deadly Sins Gang and all their glory! Join Meliodas and the other Sins on their quest to defeat the Holy Knights and restore the kingdom of Liones! 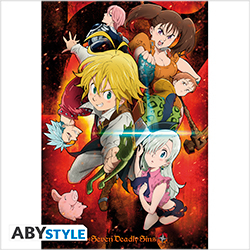 This officially-licensed The Seven Deadly Sins poster by ABYstyle is printed on high-quality, glossy paper. 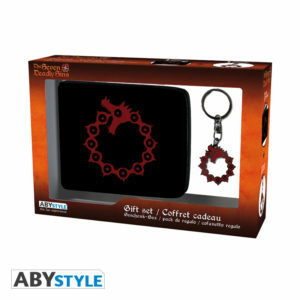 With both the keychain and wallet displaying matching Emblems, this set is perfect for gifting to any Seven Deadly Sins fan! With its easy to wrap packaging and specially designed product viewing window any fan will be in for a treat! This mug by ABYstyle represents several emblematic members of the Seven Deadly Sins group. It is also microwave and dishwasher safe! ©Nakaba Suzuki,KODANSHA/The Seven Deadly Sins Project,MBS.